The first steps steering a kite, the first meters you are dragged through the water. And suddenly you experience this feeling of freedom when you finally glide over the glittering surface of the water. Beneath you the turquoise sea, the speed increases, adrenaline rises and the wind carries you. This feeling is prone to change your complete life. We talk from experience! Absolute beginner or advanced kiter, practicing jumps, foil kitesurfing, children or individuals with special needs – we cater for everyone. Through the years, our team has been teaching and licensing more than 14.000 kite students . If there is anything we have, it is for sure years of teaching experience! 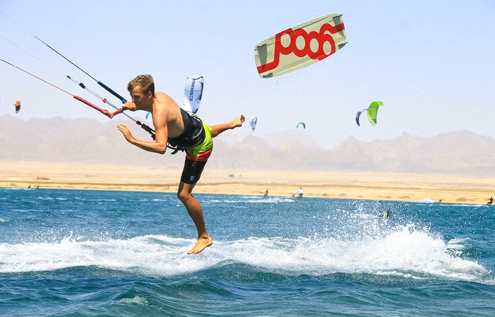 Our goal is that – under the supervision and guidance of professional VDWS and IKO kitesurf instructors – you spend as much time as possible on the water to experience a fast learning success. Discover with us the joy playing this sport. In a secure environment, with competent support and with loads of fun while doing so! 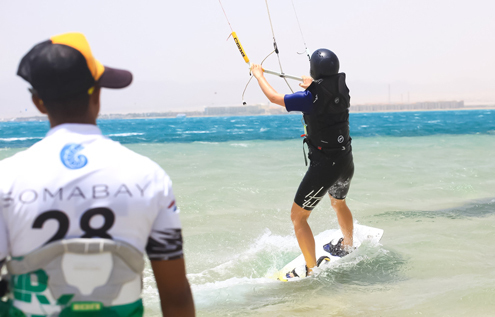 Old or young – if you can swim and are fit and healthy, your career as a kitesurfer can start. The rumors that you need a lot of strength to be a kitesurfer or that it is a sport for men are not true. Therefore girls – no worries: go for it! 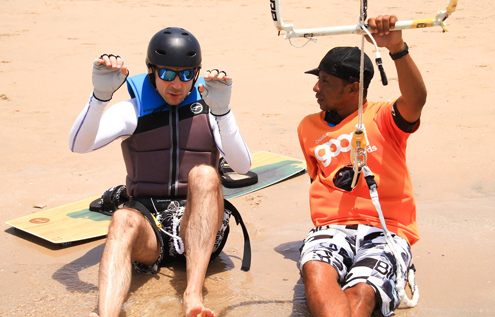 All our kitesurf courses are VDWS certified and our teaching methods are aiming for fast and secure learning success. Our slogan: “Learning by doing”. We offer courses in German, English, Italian or Arabic and there are maximum 4 participants per course. 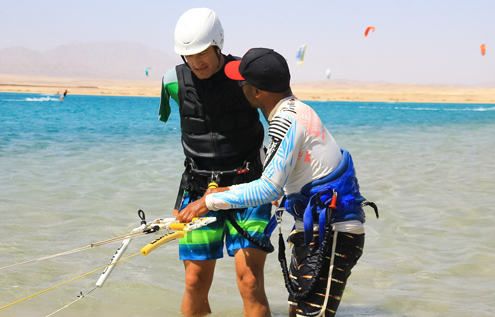 Thanks to continuous improvement of the equipment, kitesurfing becomes safer from year to year. So the final question is: which course fits you? *Children under the age of 16 are only taught in private and semi-private courses. Advanced – On shore, on water and in the air! Refresher – When was the last time you stood on the board? Check up – We’ll be there when you need us! For all kiters who would like to rent equipment but don’t have the license yet or who want to qualify for their license. 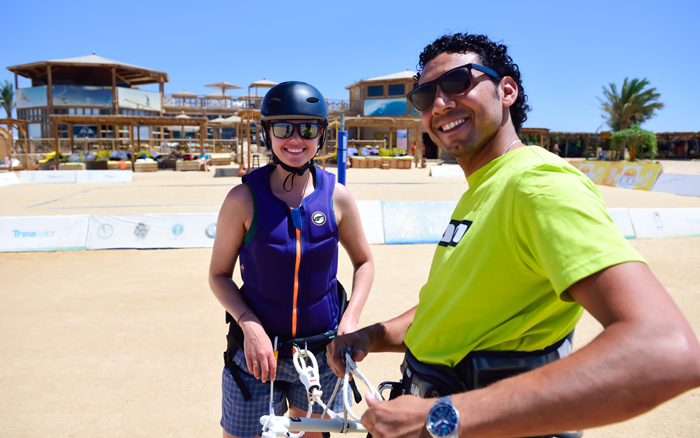 One hour check up with one of our kite instructors and you should be able to pass your license with no problem at all! Congratulations! If you’d like one of our instructors to concentrate only on you – then one-2-one is the way to go! We recommend these private lesson also for children and individuals with special needs or a handicap. 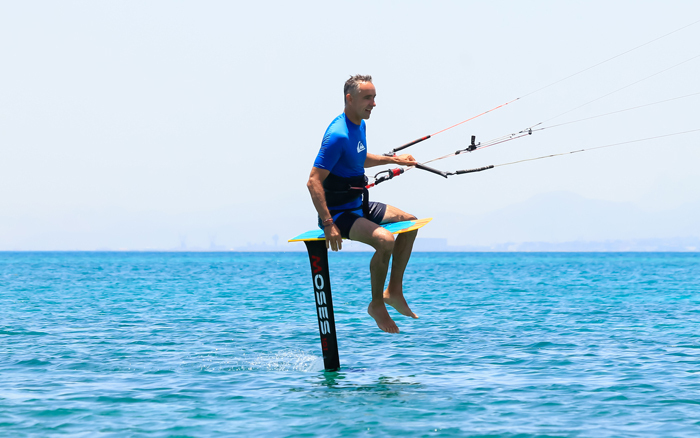 With this private lesson you will get the full attention of the kite instructor just for you! For couples, friends or kids who want to practice as a duo. Just the instructor and the two of you – nobody else to share his/her time with. Enjoy the time together on the water, observe your buddy, analyze together how you felt during the different exercises and create an even stronger bond. 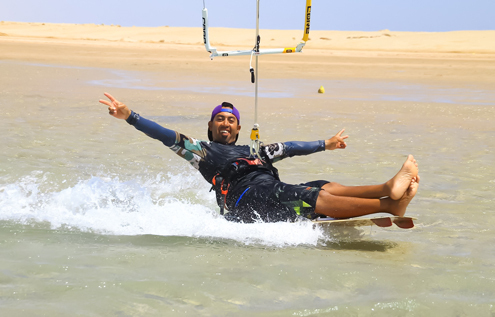 To learn foil kitesurfing, you need a VDWS license level 5 or an IKO license level 3N. You must be able to ride upwind and kitesurf safely in deep waters. 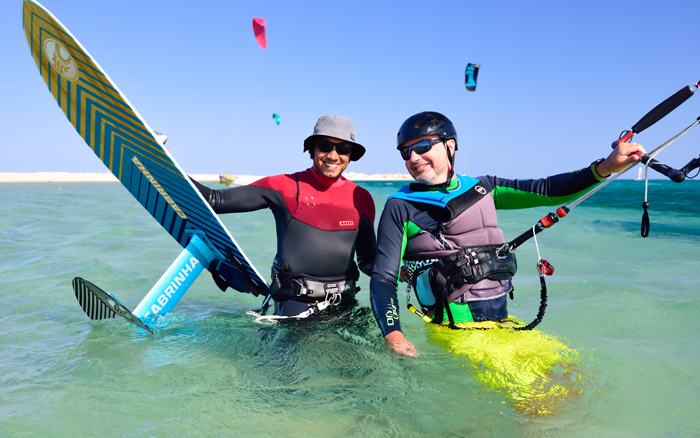 You have to demonstrate – even with light wind – perfect kite control and have to know how to relaunch your kite in deep water with light wind. 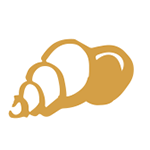 We offer foil courses either as private one-2-one lesson or as semi-private lesson. * Please note that at the end of the day, you only gonna pay for those sessions that actually took place. If there is not enough wind and the course can not take place, you will not be charged! Non-attendance will not be refunded.